Mary Beth is available for a wide variety of inspirational, community, and corporate events including concerts, women's ministry programs, worship leading, conferences and retreats, church worship services, fund raising benefits, Christmas events and other holiday concerts. Her performances offer a heartwarming experience filled with warmth and intimacy, spiced with high-spirited humor and spontaneous musical vignettes. Mary Beth presents an inspiring message of hope and encouragement. Woven throughout her piano artistry are stories that have influenced her music and defining experiences which have strengthened her faith journey. Much of the music she has composed has been inspired by her daughter Jody who was born with cerebral palsy and autism and later diagnosed with severe mental illness. Mary Beth is accompanied on several piano selections by breathtaking video images of snowcapped mountains, serene sunsets reflected in the sea off the Pacific shoreline, moonlit starry nights and more. These unforgettable impressions of God's creation are truly awe-inspiring and add a uniquely appealing dimension to her passionate piano performance. Mary Beth has numerous topics from which you may choose, or she will design a program specific to your theme. "When my friend Mary Beth Carlson shares her ministry of music, it will always be powerful, professional, yet very personal! Best of all, through the weaving of songs and stories, Mary Beth draws the listener into the extraordinary fellowship she enjoys with her precious Savior. I highly recommend her ministry to your church or women's event!" "Mary Beth is more than a professional musician and artist. God has truly gifted her with a ministry of music. Her ministry at the piano has moved church leaders from many different nations, various denominational backgrounds and a range of musical tastes." "Mary Beth is a delight and brought our district women's retreat to a new level! Never have I experienced a retreat speaker more approachable and friendly. She interspersed her beautiful piano music with her speaking, perfectly complementing our topic and keeping the women interactive and interested throughout the weekend. Mary Beth made each session practical and applicable, yet vibrant and original. Her engaging, refreshing and relational speaking style drew us in for an enriching weekend of personal reflection and renewed commitment to the Lord!" "We heard nothing but positive comments about your performance! Repeatedly mentioned was how 'real', 'compassionate' and 'genuine' you were. It was a perfect mixture of the Word, music, and testimony! God is using you in powerful ways, Mary Beth." "Take some of the old time favorite hymns, add some of the great modern choruses, combine with the awesome talent of Mary Beth Carlson, and you have an artistic offering that is sure to please the discriminating listener. Her piano/instrumental renditions will bring peace to your soul and refreshment to your spirit." "Working with Mary Beth Carlson and her team was a delight. They each were so professional and accommodating to make our event flawless from pre-event to post-event, according to what our desires were. Most exhilarating however, was Mary Beth's magnificent performance. Her thoughtful, event-specific musical arrangements, festive Christmas medleys and heartfelt glimpses into her life were a real encouragement to the variety of women who filled the worship center! Having a personal insight into how music has been therapeutic and useful for Mary Beth in dealing with life's celebrations and challenges provided such an authenticity to her entire presentation. How unusual in this day and non-personal age to have a presenter be honest and open... this was a genuine inspiration!" "A warm, engaging and gifted speaker, Mary Beth has that rare quality that people love; authenticity. She shares with honesty, compassion and humor real life experiences and her passionate love for the Lord. You walk away with hope in your heart and a fresh spring to your step. She would be a fabulous speaker for any women's event. The music she incorporates into her presentations has a sparkle like a cool mountain stream, a depth that moves the heart and expands the spirit. It is inspiring, uplifting, and a beautiful expression of her deep and powerful faith." 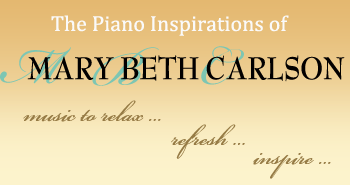 "Mary Beth Carlson's touch on the piano and her beautiful personality bring out the heart and soul of her music. Her songs reach that deep part of the listener." "In and beyond her music, Mary Beth exhibits a quiet, sweet confidence that has developed through learning to trust the Lord through difficult times. This infuses her music with an added dimension, one that encourages hearts and focuses our gaze on the Lord and His faithfulness." "Mary Beth's music-making is not only creative and inspiring, but artistically beautiful. Her performance is pleasing to the ear and satisfying to the soul. Her warm, generous spirit and personality win people over from the start, making them feel loved and valued. She is a treasure!" "Mary Beth Carlson's music blesses me! She generously shares her musical gifts as she ministers at church, entertains on her recordings and in live performances, and partners with the Faith Matters radio program. Thanks, Mary Beth, for who you are as a person and the marvelous ways you delight so many with your music!" "What Mary Beth offers is not just talent - it's a spiritual gift - because her music builds our faith in Christ. How often her unusually soothing music has lifted me. Her music reaches deep, bringing a sense of God's nearness. Mary Beth creates songs out of a soul which has a reservoir of redeemed pain. She has chosen to use the trials of life to minister to others. Her gracious manner and willingness to encourage others comes through and makes me realize why her music is so tender--it's simply an overflow of who she is in Christ." "Being a part of Mary Beth's performance is a form of worship. Mary Beth shares her faith, her sense of humor and humility, her joy and her gift to inspire... The first time I heard Mary Beth speak, I was certain no one else could be in the room; that she was speaking directly to me, sharing my same thoughts, fears, joys and love of our children affected by disability. I have never been touched by someone that I had never met, to have someone to see within and speak into my heart with such honesty. Mary Beth blesses all who hear her music with her gift to inspire and encourage!" "Mary Beth's music is terrific! She is an extraordinary performer that one never tires listening to." Erik Nordstrom - Executive Vice President and Director, Nordstrom Inc.
"Listening to Mary Beth Carlson play is like standing in the light of love." "Feel - good, soothing...beautiful, well-crafted...definitely qualities of Carlson's music." Contact us for additional information or to schedule an event.